Heating is a necessity for many species of aquarium fish, both in saltwater and freshwater tanks. Unlike humans, fish cannot regulate their own body temperatures and so this is where the heater comes in. 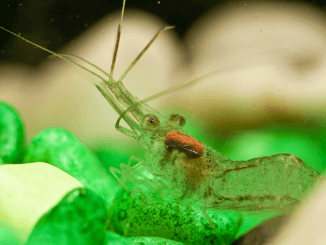 They rely on the water that they’re living in to maintain their body temperature so it’s important that the water in your aquarium stays as stable as possible. A large percentage of fish require warm water to survive, so unless you live in a year-long warm country, the likelihood is, you’ll need a heater to keep your tank at a consistent temperature. In this guide, we’re going to take a look at why you need a heater, the different types of heaters available and then we’ll do a deep dive review into the seven of the best heaters to help you select the best aquarium heater for your needs. Do you Need an Aquarium Heater? Where Should I Place My Heater? Do I Need Two Heaters? Do I Need to Check My Heater? It’s necessary to have a heater in most aquariums to replicate the natural environment and water conditions that specific species are used to living in. 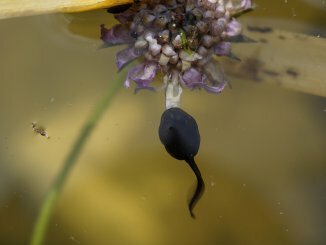 A heater raises the water of the tank, usually to between 76 and 80°F, sometimes slightly cooler and sometimes slightly warmer; again this depends on the species you are keeping. The heater also maintains a consistent temperature using a thermostat which is usually inbuilt. 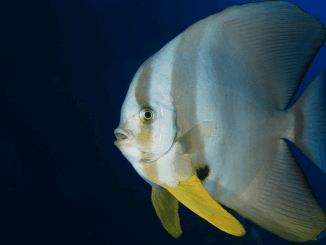 Changes in water conditions can lead to stress in fish which can be fatal if they are exposed to prolonged episodes of stress. Keeping the water temperature consistent mimics their natural environment as large bodies of water (such as the sea) do not drastically and quickly change in temperature. It’s also worth noting here that in some countries, fish keepers have the opposite problem of the weather being too hot and heating their tanks too much. In cases like this, you can use aquarium coolers instead of heaters. Some people choose to keep more than one heater in their aquarium, especially if the aquarium is large and is being kept in a cold room. This is ideal because if the first heater stops working, the second will keep the water at the desired temperature. If you do choose to keep two heaters, place them at opposite ends of the tank. If you’re just starting out in fishkeeping, you can read some other common mistakes the beginners make here. There are a number of different types of heaters. The one you choose will depend on your tank size, the species of fish you are keeping and your personal preference. We’ll take a look at what the different types are and how you work out which is the best type of heater for your aquarium. The five main types of heaters are immersible, submersible, substrate, in-line and filter. An immersible heater is also known as a hanging heater. It hangs over the top of your tank and the heating element (which is usually encased in a glass tube) sits in the water to heat the tank. These are probably the most common heaters for beginner freshwater tanks and often come as part of a starter pack. You’ll need a hole in the hood of your tank to allow this heater to sit over the top of it. This type of heater is usually less efficient but does provide basic heating. 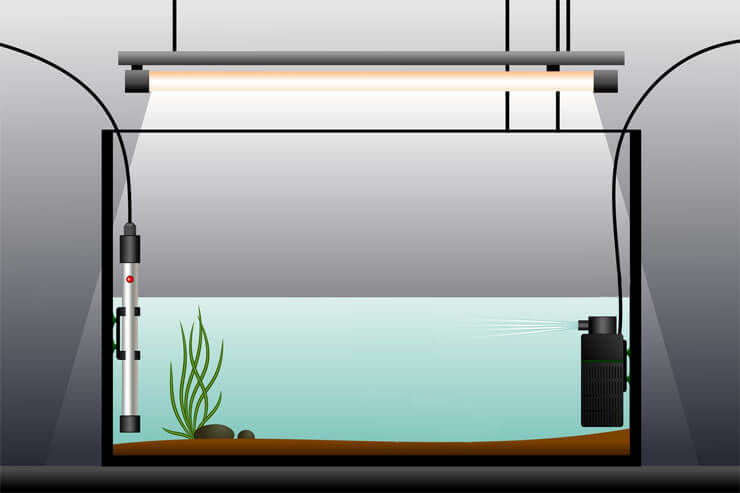 Immersible heaters are not recommended for brackish or saltwater set ups. Submersible heaters are ones that sit under the water. This heater should be placed next to the inlet of the filter so it heats the water up as it comes back into the tank. This heater has a coiled element encased in a glass or toughened plastic tube. Glass can be prone to cracking if the unit overheats, tough plastic is less prone to cracking. These heaters usually have an LED light near the top which will tell you when the heater is on. This heater will help to keep your tank at a more consistent and stable temperature than an immersible one. These are typically used as an addition to other heaters and come in the form of wires which are fixed onto the base of the aquarium. This type of heater peaked in popularity in the 90’s, especially in planted tanks because the heating promotes gentle water movement which can stimulate the growth of roots. These heaters are much less common now and quite expensive. This heater can be fitted between the sump or filter, so that it heats the water up on the way back to the tank. It is usually made of heatproof plastic so it won’t start fires. This type of heater is ideal for those who keep larger aggressive fish who fight with equipment, like some cichlids. They are a lot more expensive than other heaters which we’re looking at and another drawback is that the more components you have outside your tank, the more opportunities there are for leaks. Some filters have combined heating elements, so that as the water passes through the filter it is also heated up. The most common filters to have heaters inbuilt are canister and sometime power filters. A range of non-adjustable heaters suitable for aquariums from 2 to 30 gallons, perfect for those just starting out with fishkeeping. If you’re on a tight budget then this is most likely the heater for you. This is one of the cheapest, yet most reliable aquarium heaters available. It has an indicator light which lets you know when the heater is on; it will be red when it’s heating the water and green when the water is at the right temperature. This heater is automatically set to 78°F which is the ideal temperature for most tropical fish. This heater is perfect for aquariums between two and ten gallons as it is small and easy to hide behind plants and other decorations. If you have a larger aquarium, this heater is available in higher wattages. You can’t adjust the temperature. Doesn’t work well with a lidless tank. Light can be difficult to see. This adjustable heater, with an automatic shut off for when it overheats, is available in 50 to 250W, so there will be something to suit every tank size. This heater is built with a non-corrosive shell. The Aqueon Pro Heater has an adjustable setting which allows you to control the temperature of your aquarium in-between the range 68 and 88°F. It has an LED light which is constantly on. This light is either red when it’s heating the water or green when the water is at the right temperature. It has an auto shut-off feature when it overheats and resets when it cools down. Choice of 5 different wattages. Reports of it being a few degrees out. Known to crack after a couple of years. 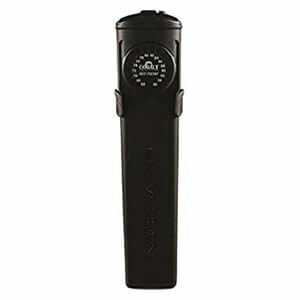 This heater has a dual temperature sensor to display real time and ideal water temperatures, available in 100W to 300W. 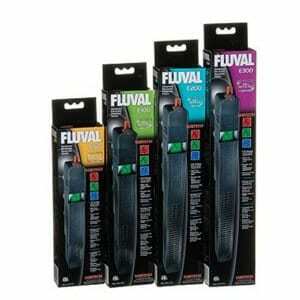 The Fluval E series of heaters have an LCD temperature display which can be set to either Celsius or Fahrenheit. They are fully submersible and have an alarm which changes the color of the LED to indicate if the temperature has changed past the pre-set temperature. This heater comes with an integrated fish guard which protects your fish from coming into contact with any heat. These heaters come in a range of wattages suitable for a wide range of tank sizes, and also come with a 5 year guarantee. Easy to see temperature display. Shows both Celsius and Fahrenheit. Safer with two electronic thermostats. Temperature may fluctuate by up to 3 degrees. Available in a large range of watts from 25W to 300W, this middle of the range heater is slim and unimposing on aquariums. The Eheim Jager heater is a simple but effective heater and comes in a range of sizes suitable to heat tanks up to 220 gallons. It is a fully submersible heater which is surrounded by a special laboratory glass (free from pollutants) which increases the heating surface and acts as a heat shield. The rod is completely watertight and has an automatic dry run shut-off, known as thermos safety control. It has an adjustable temperature control and can be set between 64 and 95°F, it also has a decent cable length of 170 cm. Auto turn-off at low water. Temp adjustment dial can be stiff. An external heater which is ideal for those who don’t like the heater being on display, of if you tank is small and there isn’t enough room for a heater. 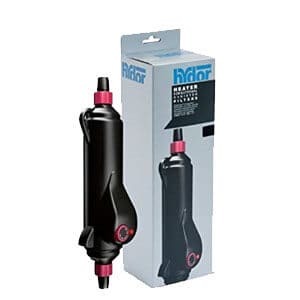 This filter is an external thermal heater which is great for both tropical and marine tanks. However, it can only be used vertically and it’s easy to connect and use. It has been designed to be used on the return line coming from canister filters or sumps, back towards the tank and heats the water up on its way back through. The positive thermal coefficient (PTC) technology is self-timing to guarantee against overheating and blowing. It comes with piping between 12mm-16mm, depending on what size you want and also has a temperature control for easy viewing. Can maintain and check the heater without putting hand in tank. Makes a slight click sound as it turns on and off. Turns on and off quite frequently. Some filters will need adapter connectors. With a 3 year guarantee, this middle of the range heater performs well and looks modern and stylish in any home aquarium. This fully submersible heater has a very sleek and slim design which fits in well with stylish homes; it also has a one touch control system. The heater has an LED that displays both the temperature the heater is set to and the temperature of the tank. The temperature can be adjusted from 66°F to 96°F. It has an integrated thermal protection circuit which shuts the heater down before it is able to overheat and is also made with a shatterproof outer casing which makes it practically indestructible. It comes in a range of sizes from 25 watts to 250 watts, depending on the size of your tank and the required heating needs. Technology to shut heater down before it overheats. Suction cups can stop sticking after a short period of time – need to be replaced. Reports of short lifespan in malfunctioning products. A complete and top of the range heating system, ideal for experienced aquarists, or those who want to take the hobby to the next level. This is a fantastic heater for those who want to take their hobby to the next level and get serious. This is the most high tech piece of kit which we are featuring. 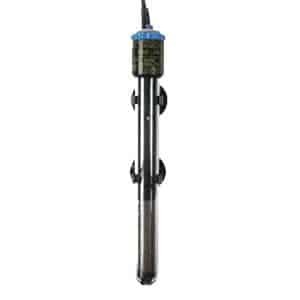 This titanium, fully submersible heater is corrosion resistant and has an integrated thermal shut-off, a digital temperature controller and calibration setting, temperature probe, protective heater guard and magnetic holdings. It has an easy to read LED display and push button controls to set the temperature. Additionally it has a smart memory chip which can restore the previous temperature in case of a failure. Magnets to hold the heater in place. Plastic outer to protect fish. Magnets can slip if placed closely to powerhead etc. Probe needs to be cleaned every few months. 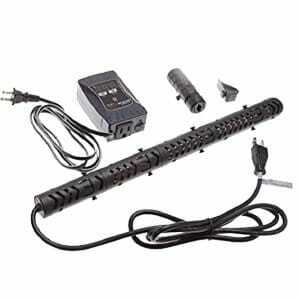 All of the above aquarium heaters are great heaters, they are all easy to maintain and function well. The best aquarium heater for one person, may not necessarily be for another. The type of heater that you choose will most likely fall down to three main factors; size, cost and personal preference. The very basic rule of thumb is that you need between 2.5 and 5 watts per gallon of water volume. This can obviously vary depending on how cold the room is that your aquarium is in, and how large the tank is. The larger the body of water, the slower the water will lose heat, whereas the smaller the volume of water and the smaller the tank, the more quicker it will lose heat so a larger watt is required. To work out how much wattage you need, subtract the room temperature from the desired temperature of your aquarium. For example, if your room is 66°F, and you want your aquarium to be 76°F, you need to heat your tank by 10°F. You can use this table to work out roughly how many watts you need to heat your aquarium. If you’re still unsure, manufacturers usually state on the packaging what size tank the heater is designed for. The price of heaters varies as you can see in the reviews above. Choosing a well-known brand will usually provide you with the best quality. Have a think about your budget and how much that allows you to spend. Which heater do you like the look of the most? Some people don’t mind the look of equipment in their tank, others prefer smaller less noticeable units and others would rather no equipment is visible at all. 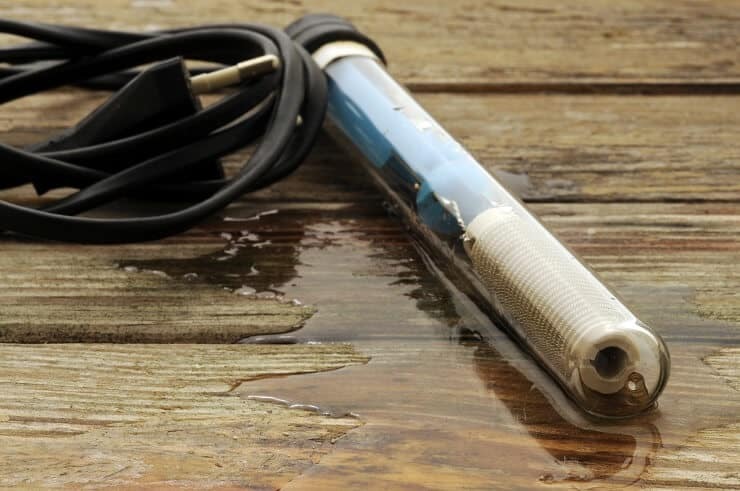 If you don’t mind your heater being on view, you’ll most likely choose a submersible heater. If you don’t like the look of them; you might want to consider an external heater, either the in-line or a filter heater. Your heater should always be placed close to the filter inlet (or any other warm flow created by power heads etc.). If you live in a cold area, ideally, you’ll have two heaters to take the strain off one. Also if one fails, you can use a backup, like this example, which will keep the water at the same temperature. One thing that we hear of all too often, are heaters overheating. Along with your other daily checks which we’ve discussed here, you should check the temperature of your tank daily. Always include a separate thermometer (even if your heater comes with one) at the opposite end of the tank to ensure the water is heated properly. This way, you’ll pick up on any problems with your heater quickly and avoid any fatalities. Whilst this might take a bit of time, it’s definitely worth doing for the safety of your fish. As we mentioned at the start, the best heater depends on what size tank you have and what you consider to be the most important functions. 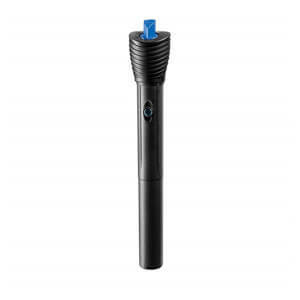 If you want an easy to use, preset heater which is both easy to install and cheap to buy, the Tetra Submersible heater will be a great option for you. 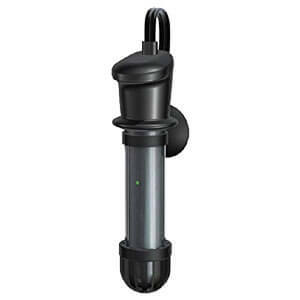 If you’re looking for something that doesn’t sit in your tank, either to save room or because you don’t like the look of lots of equipment in your tank, the Hydor ETH In-Line ExternalAquarium Heater will be a great choice for you. If you’re an advanced aquarist, looking for the best quality, then the JBJ True Temp Titanium Heater will be more appropriate for you. We’d love to hear your reviews if you have any of the above products.